But wait, thats not all. 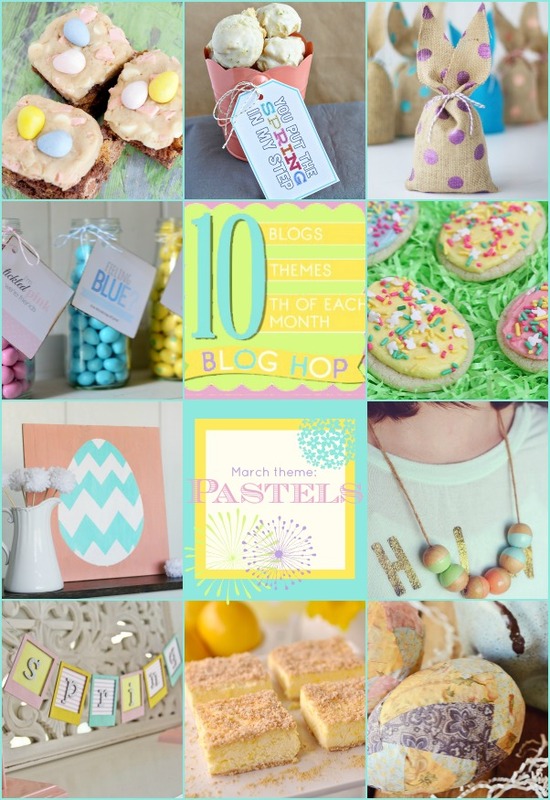 It’s the 10th day of the month, so I’ve gathered my creative blogging friends, and we came up with a PASTEL theme to create projects around, since SPRING is upon us! This begins our 11th month with the blog hop collaboration. We had so much fun with it the past 10 months, we decided to take it another round. One friend needed to part ways, so we added the amazingly talented Chelsea from Two Twenty One to the mix. If you’ve missed the past ten months of fun, please check them out! Isn’t that some amazing-ness??? I love my creative friends, and I love to see what they come up with each month around our theme–it’s so fun! Now back to my recipe. It’s quite simple, you see. You take a brownie base and spread it in the bottom of a pan (homemade or from a pan). 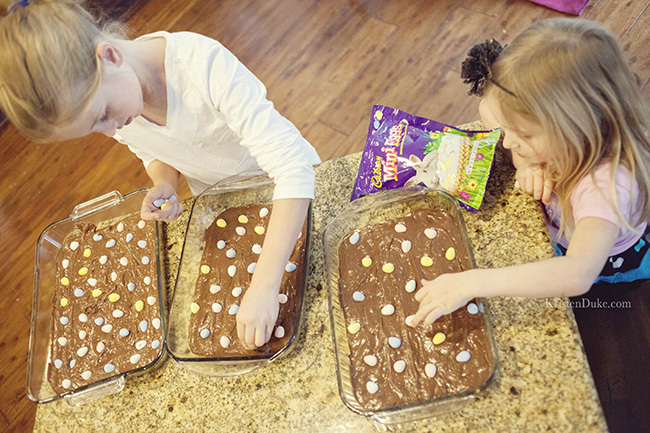 Then sporadically place those delectable Cadbury Mini Eggs, and cook the brownie. Then drop heaping spoonfuls of egg-less cookie dough and gently spread it all around. I mixed in some pink pastel chips (chopped up melted wafers) along with my fave white chocolate chips. Below are my helpers, inspired by the promise of sampling the mini eggs at the end. Yes, I made three pans because I was assigned to make birthday treats this month for the girls at church. Each second Sunday we celebrate the month of birthdays and the leaders rotate who makes the treats. 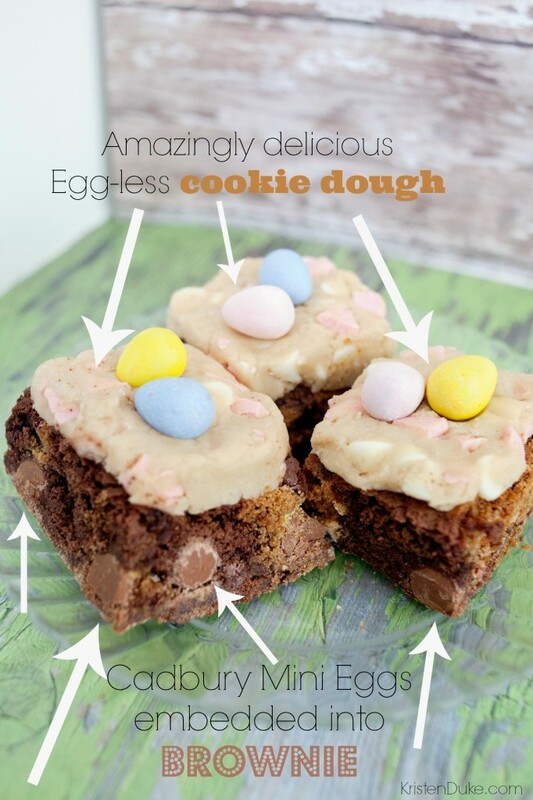 Brownies, cookie dough, and Cadbury mini eggs, what could be better? 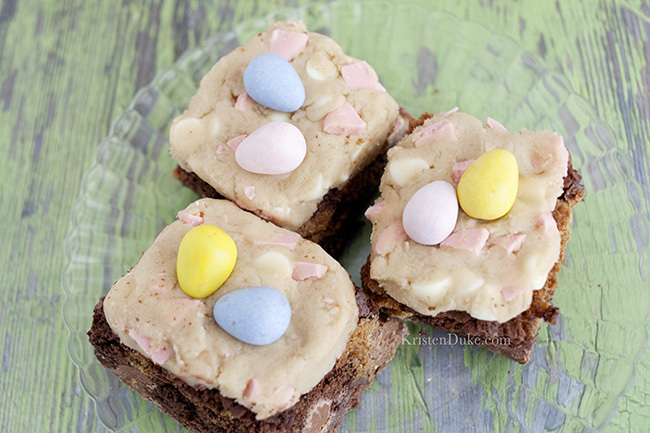 Place Cadbury Mini Eggs on top of brownie batter, all around pan. Cook brownies 15-20 minutes in 9x13 pan. Make egg-less cookie dough by mixing ingredients together in bowl. Add in vanilla and salt, mix. Spread by spoonfuls on top of brownie. 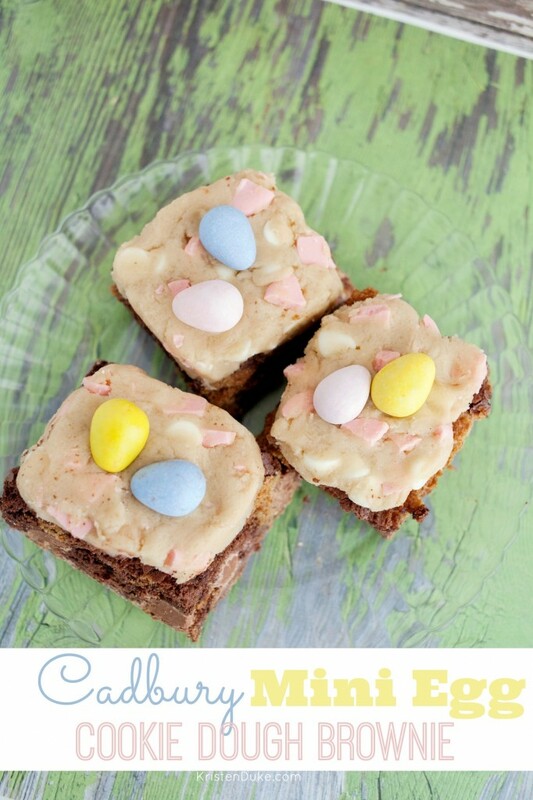 Cut brownies, place Cadbury Mini Eggs into center of each brownie. I was kinda bummed that the Cadbury Mini Eggs sunk into the brownie, and even when cut it was hard to tell they were in there, but they are there a-plenty. 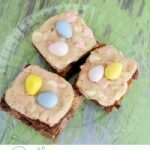 This is a fun spring or Easter treat everyone is sure to enjoy! 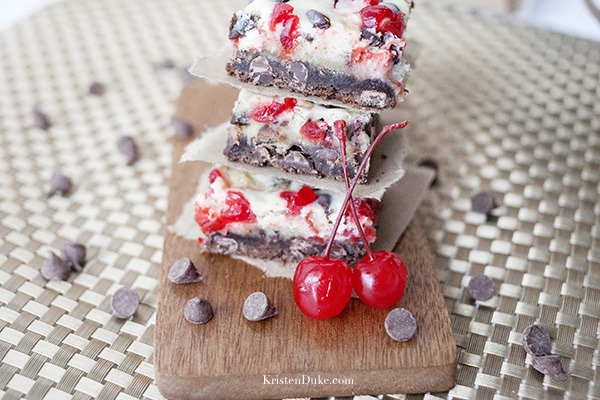 If you like this, you may like the Cherry Miscellaneous Bar.